The Super-denomination Brethren Church is a friend of the common people who engage in physical labor, such as farmers, loggers and fisherman. Even the pastor, it is fine that if he is not capable, not a good speaker and illiterate. Even the first church Christ himself was also no-name person, as well as his disciples and the early church leaders of the Waldensians and the Brethren were same. 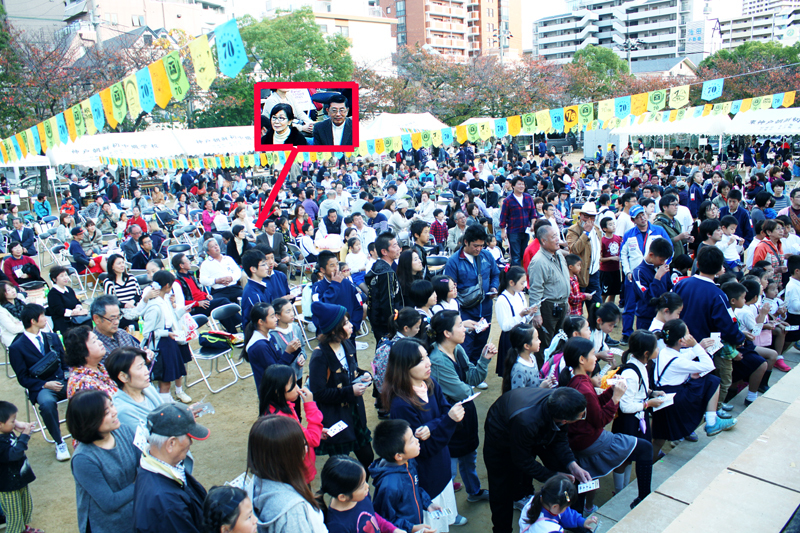 It is a group of Christian Church’s “妙(Miyo = Piety people of Jōdo bukkyō (浄土仏教= Pure Land Buddhism)”. “Brothers and sisters, think of what you were when you were called. Not many of you were wise by human standards; not many were influential; not many were of noble birth. But God chose the foolish things of the world to shame the wise; God chose the weak things of the world to shame the strong. God chose the lowly things of this world and the despised things—and the things that are not—to nullify the things that are.” (1 Corinthians 1: 26-28. New International Version). God, the creator, has consistent standards when choosing people, humans and communities. God has been choosing “the things that are not” two thousand years ago as well as four thousand years ago. God never choose people based on excellency, ability and power. Why God did choose Israel? We are not able to understand the meaning of “more numerous than other peoples, for you were the fewest of all peoples”. There were many few ethnic groups. The original Hebrew word “mot” means “same as nothing, smaller, poor”. mot is translated as “the tongue of the righteous is choice silver, but the heart of the wicked is of little value” in Proverbs 10:20. Therefore, the prophets, leaders and apostles, who were chosen and used by God, were same as “no value”. 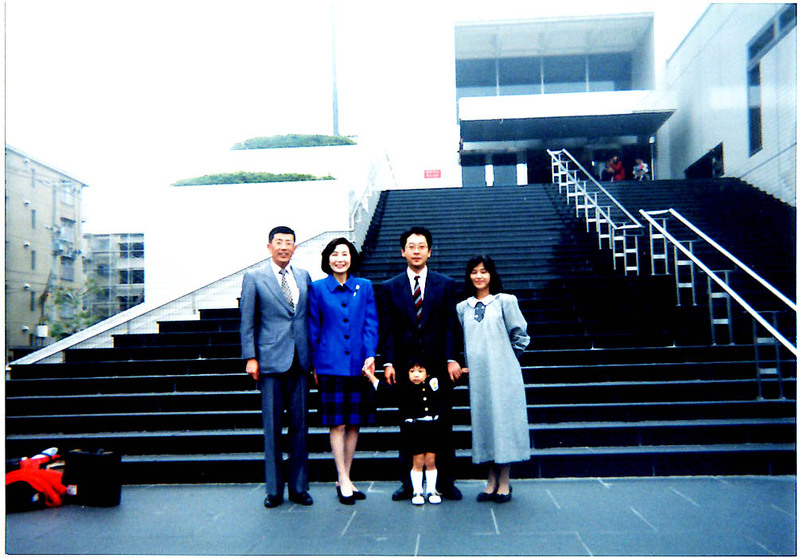 From March 7, 1995, the current our church had given birth in Kobe City. We started to talk about the gospel in front of the station in the city where was attacked by the Great Hanshin-Awaji Earthquake. 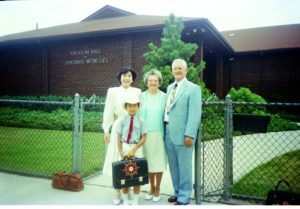 Mr. Shingo Fukuoka and his wife Mrs. Wilsey, who currently live in Hong Kong, are the first fruits of our church. They are bringing up their children gently, based on the Bible. 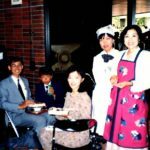 At the time of their returning to Japan, they still engage in working for sharing the gospel together during our worship, and we appreciate their grace. They conducted their missionary work to let people be familiar with the Bible to meet with Christ at the neighboring church, not giving message to invite to their church. For three years, they continued without taking rest even under rain, snow and severe sunshine day. Encounter with Pastor Iwai Kensaku (former pastor of the Kobe Church, the United Church of Christ in Japan), Mr. Tetsuro Honda (Former Province, Franciscan of Japan), Pastor Hidetoshi Watanabe (Director of Solidarity Network with Migrants Japan) had a great influence on my view on the Bible. Because in the year 2000 which passed five years since the Great Hanshin-Awaji Earthquake, I first touched “Liberation theology”. The Roman-Catholic church greatly changed at the Vatican II Congress [Latin Concilium Vaticanum Secundum 1962-1965]. The reason why the content of religious believers was reformed by the Church law nearly 80% has been reformed“Liberation theology”. It is thanks to “Liberation theology”that I have had a compassion with the orphans, single women who lost their husbands because of war and suffering, and refugees. The pastor’s living style is like always challenge through narrow gates. As a labor pastor, my income from as a language teacher of Hebrew, Greek and English, and a lecturer at Union University, are very few. It is the thorny path that cannot be done anything without my wife’s patience, love and prayer. Since after 2001, it has been transforming to the church that cooperate with people who are hurt in the society, through filled with the Holy Spirit, thanksgiving , joy and hope. If you would like to communicate with the pastor, please contact below. You can also refer the schedule of our volunteering work. <<Reference>> Contact: Pastor’s residence of the Kobe International Christ Church (=House / Office)　Church is located in Kariguchi-dai 6-chome. While I was working at a foreign shipping company in 1975, I had a door-to-door visit of the Watch Tower (the Jehovah’s Witnesses) believers. I was the third generation of the Roman-Catholic church family, therefore I was going to refute the visitors, but I became a follower of Mr. Kinji Nakano. I changed my job to teach English conversation and doing test preparation private tutoring for my boss’s son, and eventually evangelism became a center of my ordinal life. 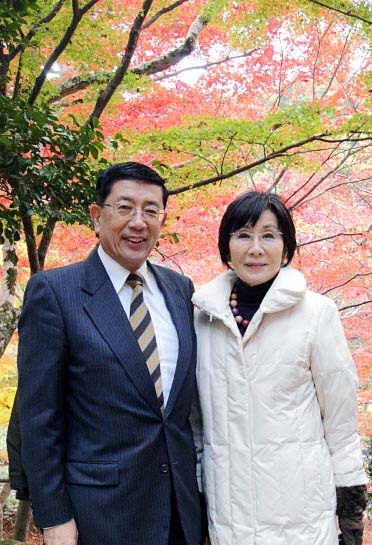 I was inspired by Mr. Motoyuki Maki & Mrs. Maki Megumi, the couple who the most trusted family for me. I still have a respect to diligence, passion and honesty of individual Watch Tower believers. I appreciate that the bad propensity to lie without hesitation was corrected by making the Bible as a mirror. 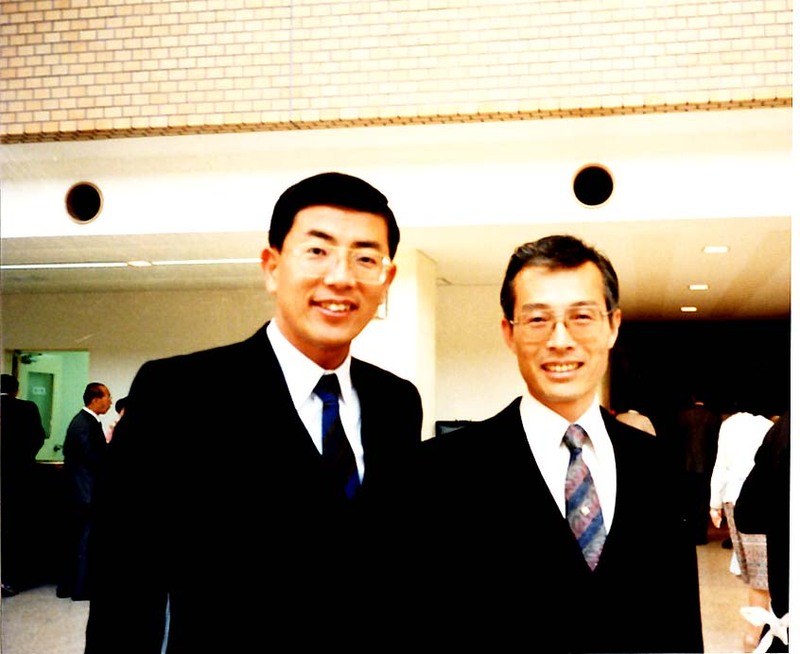 I had studied at the Kaihatsu Senkyo School (Pioneer Evangelism School) and Kingdom Ministry School (Kingdom Ministry School). 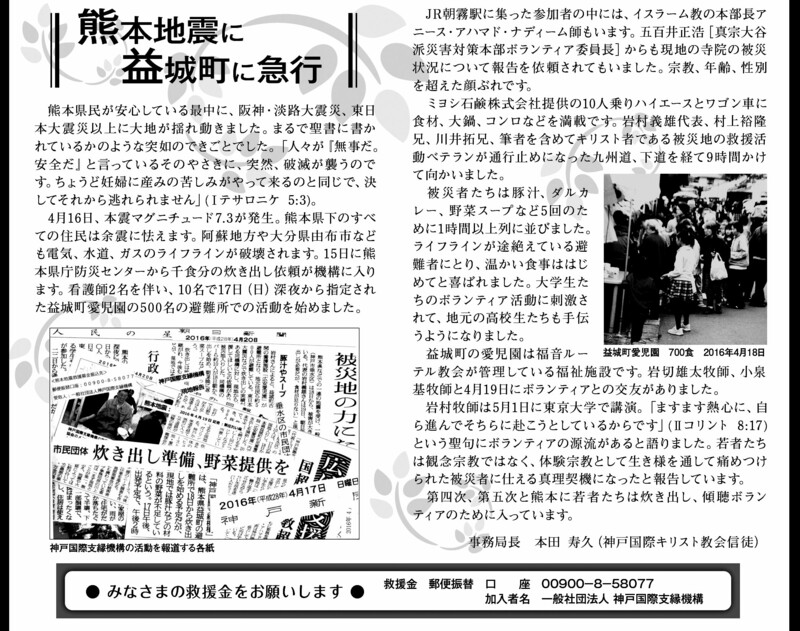 I was also covered on publications as an exemplary pioneer in the area of Kobe Meimai housing complex. I was familiar with the members of the governing body of the Watch Tower world headquarter through the visit to the United States. Kayoko Iwamura drew people’s attention as the person who was the most providing magazines in Japan. In the 1980s, it was the time when we purchased “Watch Tower” magazines at pioneer discount prices and sold them. We had found people who periodically purchase more than 300 amounts of magazines monthly at door-to-door visits in the area of Meimai area. Yoshio was having a shepherd living life with always over 20 students those were refused by husbands, Christian church believers and young people. My wife Kayoko had been becoming difficult in walking because of overworked, and her eyes had become hazy. As the Presiding Overseer, I persecuted the Christian church and gave my passion on the abolishment. I read through the Bible because of the disease of the pioneering wife Kayoko. Although it is not only the Watch Tower association, people tend to see own organization as an absolutely one while saying that human beings are incomplete. The history of periods of ebb and flow is telling the transition of the hierarchy of the control system, companies and religious groups. In 1988, I was realized mistakes about Christ, organization worships and repeated interpretation from the Bible. Staying as the director, 38 people withdrew from the group with me. There was a separation from people who were like a same blood family. After I left from the Watch Tower, the theory of the group was beyond my ability. 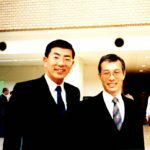 Since I received the advice from Toshio Nagasawa, the former editorial director of Word of Life, I attended the Kobe Reformed Theological Seminary (1993-1998). It did not attend to receive a qualification. I also attended to learn about the doctrine of the first Christian church father at the Kobe Lutheran Theological Seminary (1996-1999) and the Asia Graduate School of Theology (AGST, 1998-2000). Through meeting with professors and lecturers, I asked them to teach some subjects of the Kobe Bible Seminary at my church. Beginning of the Kobe International Christ Church emphasized theory, that is, doctrine and teaching. Calvin said, “The Work of the preacher is not to end with a sermon from the lecture”. Preaching to the Protestant church of the Western Church is a life. “Preach the word; be prepared in season and out of season; correct, rebuke and encourage—with great patience and careful instruction.” (2 Timothy 4:2) However, I stopped talking. I chose people who were oppressed. “When they cry out to the Lord because of their oppressors, he will send them a savior and defender, and he will rescue them.” (Isaiah 19:20) “My mother and brothers are those who hear God’s word and put it into practice.”(Luke 8:21) Eventually I encounter opportunity of transformation of the entire church shift from theology to actual work. 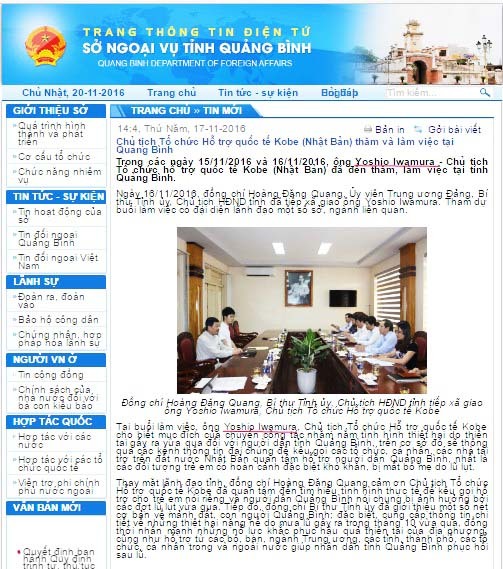 *Please refer to the AGST (Asia Graduate School of Theology) News. The ten years of the second stage (2000-2010), I served at the pastoral association for unifying Christian churches. The third stage (2011- ), I start the work of Co-existence, Share sufferings, Ku-en (connection born from sharing sufferings) with the people who are made to be small. The motivation to refute the heretics came from responsibility for misguiding many people. In order to let people notice about the mistakes, I published “Is God’s name ‘Jehovah’” (Word of Life) and “Discuss with Jehovah based on the Bible”. The first book is also published in Braille version for blind people. <<Reference>> My writing “What is the gospel?” is the last destination. ≪動画参照≫ 超教派ブレザレン 神戸国際キリスト教会 街頭宣教シーン<<Reference video>>　The scene of street missionary of Super-denomination Brethren Church, The Kobe International Christ Church. In the next ten years from 2000 to 2010, I devoted myself to the work for unifying the Christian churches. I was the leader who was telling a bad reputation from the house to the house that Christian churches were schematized. It was my atonement of myself because I had been abolishing the Christian churches. I served for realization of the peace of the Christians, I hold such as the Bible exhibition to unify based on the Bible (May 9 ~ 14, 2001), Kobe Bible House (January 31, 2003 ~) and Tarumi Prayer Meeting (July 17, 2010). I was able to open and rebuild by cooperation of many people. As a secretariat of the 150th anniversary of the Japan Protestant missionary that was held at Pacifico Yokohama from July 8~9, 2009, I commuted from Kobe to Tokyo about a year. At the 9.11 terror in 2001, churches were asked what we can do for the society. We are just a small church that cannot do much things, but we have overcame difficulties by people’s understanding about the civil movement activities out of church work, prayers from fellowships and support from friends and wife. 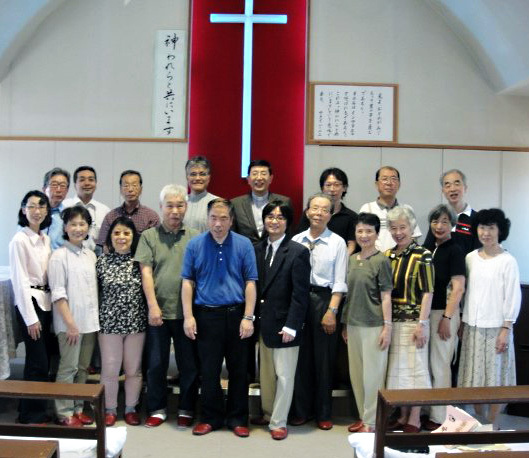 The Opening of Tarumi Prayer Meeting The person next to Pastor Akio Sakata, who is at right corner of the back row, is Brother Hisayoshi Ono (Died on September 9, 2012) from Tarumi Roman Catholic Church. 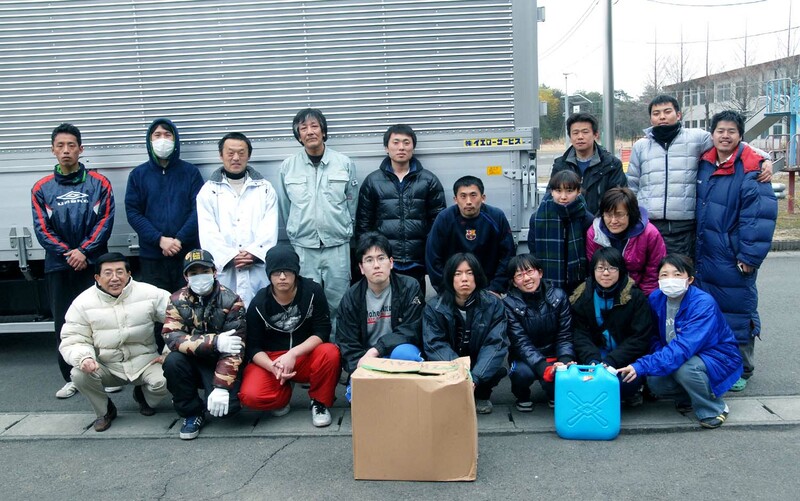 He carried heavy rice packet for the first Tohoku Volunteer on March 18, to our Pastor’s residence at Kariguchidai. The third stage: Kuen (Relationship to share sufferings) with those who are made to be small. Work together as one church for volunteer works. In the third stage, the occurrence of the Tohoku earthquake and tsunami also pushed the church. I repented the walk of religious person who had lived exclusive and intolerant living life that saves only us, while telling people “love your neighbor”. The student volunteer Tomoya Yamamoto and Yuki Shibakasa, who have been working at Kamagasaki (the poorest town in Japan) together with church members from the beginning.<<Reference>> Moreover, we are receiving prayers, cooperation and supports from many people not only neighboring Christian churches but also including the church management office and neighborhood. The late Principal Mr. Yun Jong-chol 尹鐘哲 on the third person from left at the back row. Participants of the 1st Tohoku Volunteer The second person from the right at back row. Lee Chi-se李 志世, Photographed by Lee Sang-yong李 相英on March 21, 2011. After our church service, we all church members go to the sports festivals, bazaars and class visits of our neighboring Kobe Korean Elementary & Junior High School and Korean High School to dance and live together. Pastor is a member of a standing committee of “Association of Japan-North Korea friendship in Hyogo”. We take part in a monthly signature-collecting campaign for a school cost-free of Korean school in front of JR Motomachi station. 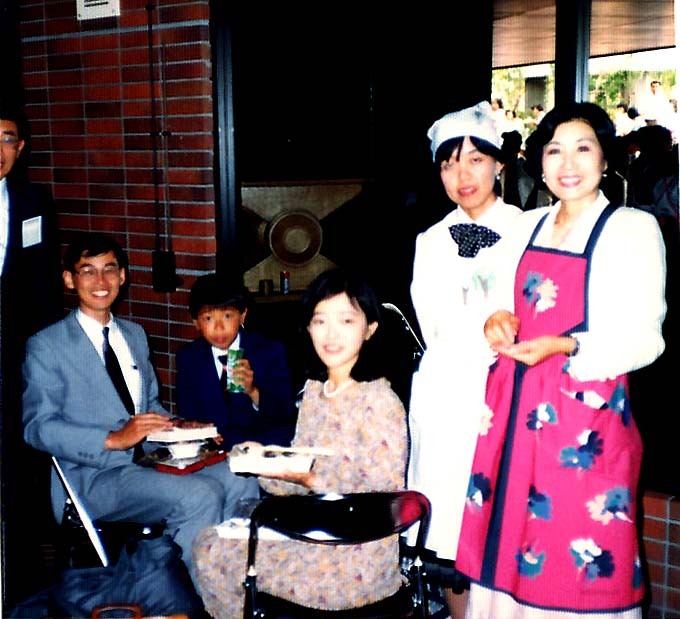 Mrs. Kayoko Iwamura is the greatest contributor to her husband, church, and volunteer activities. As the mother of Volunteer-dō, she passed away on October 17, 2016. She raised many young people. 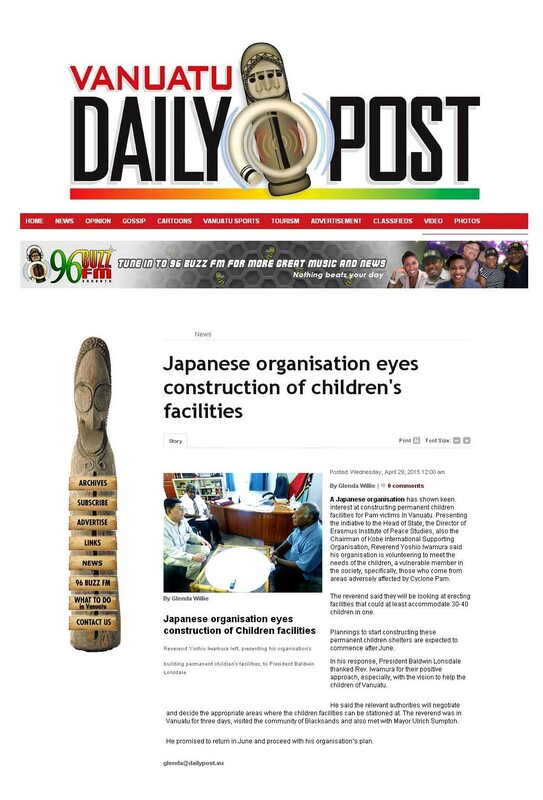 Facilities for orphans, “Kayoko Children Center” and “Kayoko Children Home” are built at the disaster affected areas. ネパール　Doleshwor TV (2017年12月28日) 短縮版　Nepal Doleshwor TV (December 28, 2017). Shortened version. 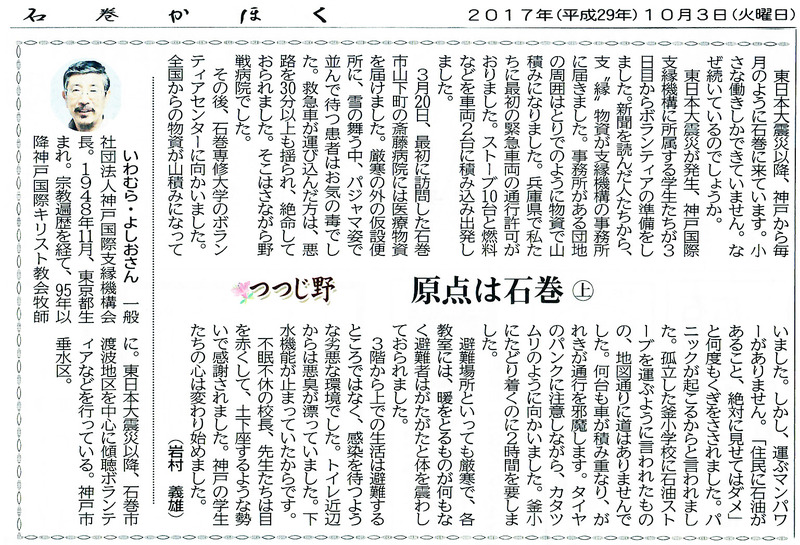 マスコミ各紙　2017年7月　Kayoko Fund　Pastor Yoshio Iwamura　Newspapers on July, 2017. 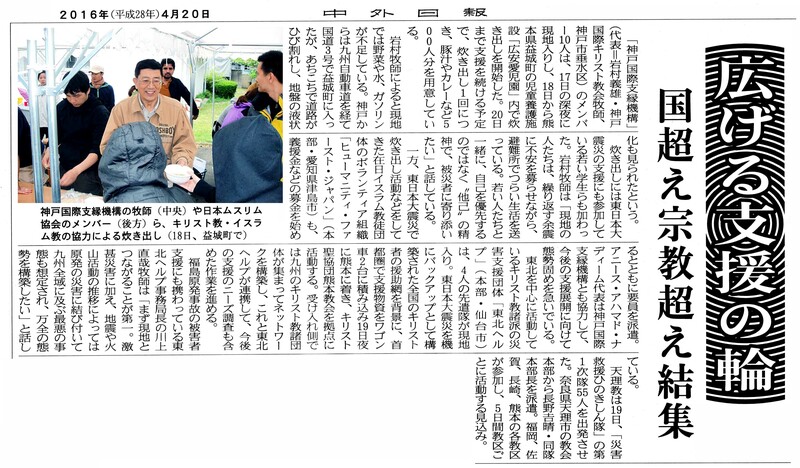 From the 1st Tohoku Volunteer, a presbyter Toshihisa Honda serves as a role to receive medical supplies in Tokyo and drive to Saito Hospital in Ishinomaki City, Miyagi Prefecture on March 22, 2011 by himself. 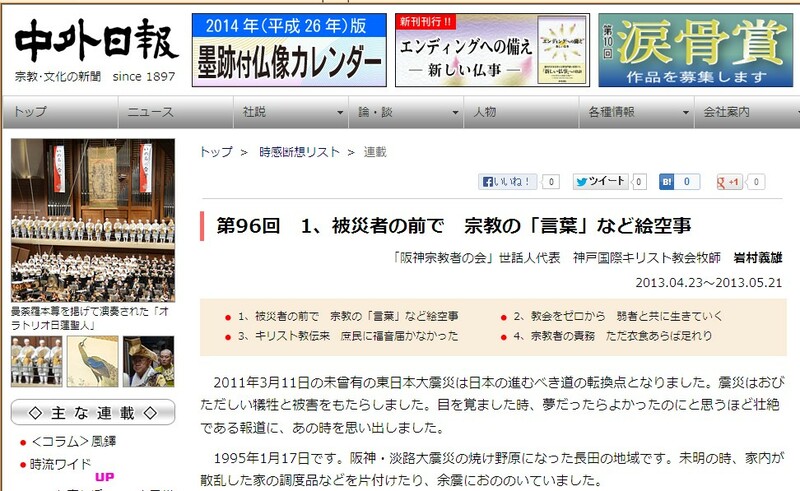 From the former president of the Kobe Shimbun Kaikan Mr. Takao Iwata, the pastor of our church was asked to give lecture about “Think about the ‘death’ together”, starting from April 11, 2011. Year of 2018 was a year with many natural disasters. The Northern Osaka Earthquake in June. Concentrated heavy rain at Kobe in July. Concentrated heavy rain on July 7 at Western Japan Flood, Masue (Haki Town), Asakura City, Fukuoka Prefecture was affected by concentrated heavy rain in 2017, and 22 people were dead out of 42 injuries). 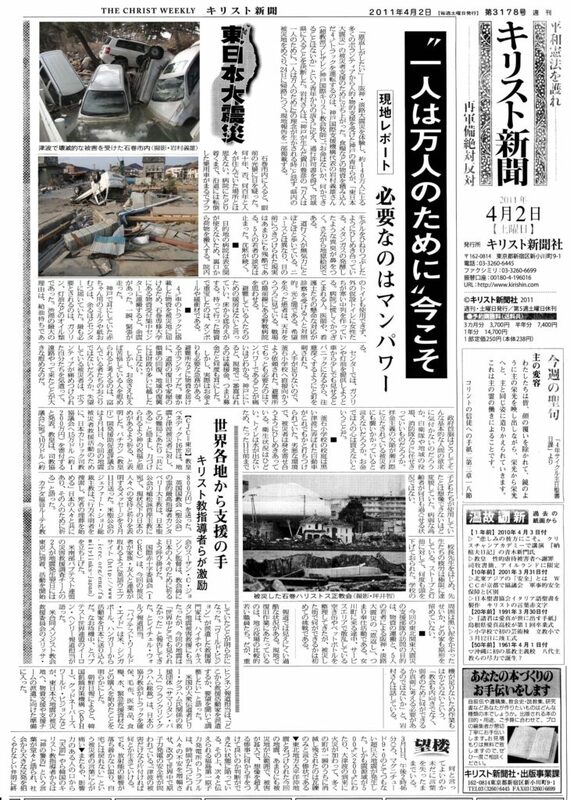 Mabi town at Kurashiki City, Okayama Prefecture, 51 people were dead out of 227 missing and injuries. Following heat wave of August, typhoon No.21 attacked in September. Continuously, Hokkaido Eastern Iburi earthquake occurred and 36 people were dead out of 41 missing and injuries only at Atsuma town. 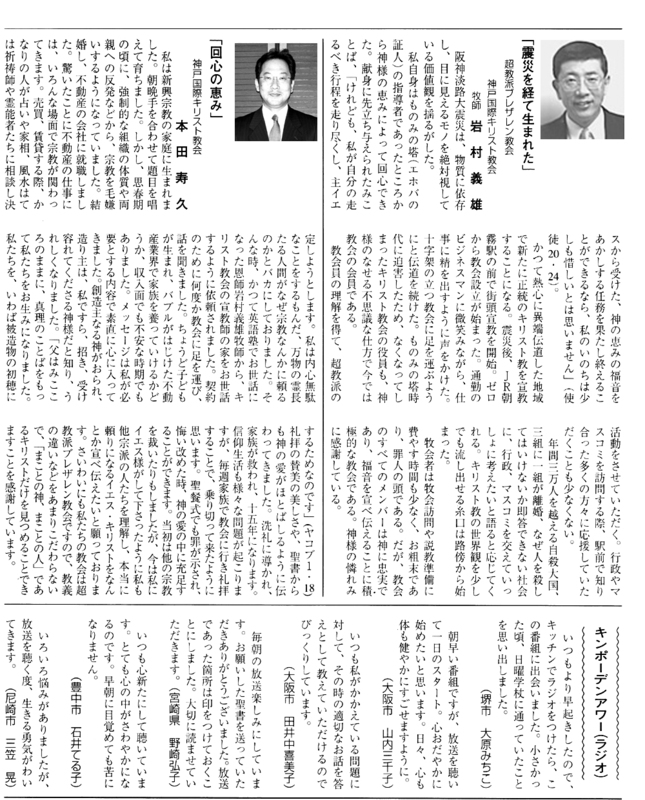 I wonder whether Ms. Shindo Son, who is the Korean resident in Japan, was safe or not. I headed to Onagawa to confirm her safety. It was because her life story movie “Oreno Kokorowa Maketeinai (=my heart is not defeated)” gave me a great impression. However, the destination had changed. 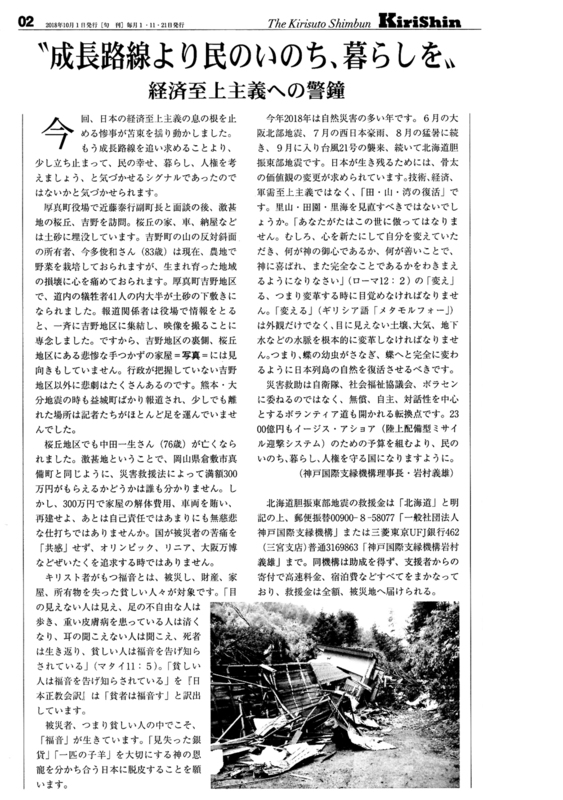 When we saw the street of Watanoha at the Mangokuura, Tomoya Yamamoto (21 years old at that time) and others said “Is it fine to leave here like that?” The national route 398 was covered with soil and we could not see the road. The money in cash register of the Seven-Eleven convenient stores was also robed. The Watanoha branch of the 77 Bank was just guarded with a high fence. 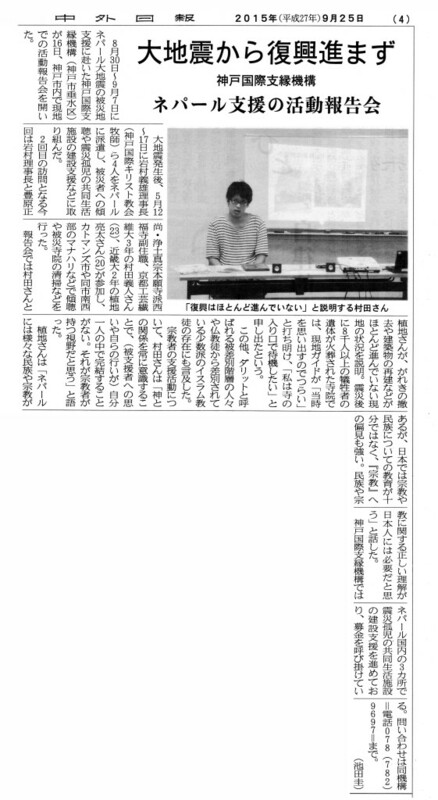 I saw that Mr. Kinichiro Satou was walking around his neighborhood at Watanoha 3 area as for his own safety. 90% of the 21,000 people ran away from the tsunami. I heard about their escape in the snowing while they were moving through seawater that covers up to their waist part. There were several houses that the first floor had been damaged or washed away because of the tsunami attack. At Watanoha, we began our work with removing rubbles first. It was to make it possible to recover the lifeline that necessary for electricity, gas and water supply related vehicles to pass through. At the temporary shelter at Watanoha Elementary School, nearly 3,000 people were gathered. It was a difficult place for handicapped people with disability certificate. Foods were distributed in the order in which people lined up, and people must be on the line to use toilets. 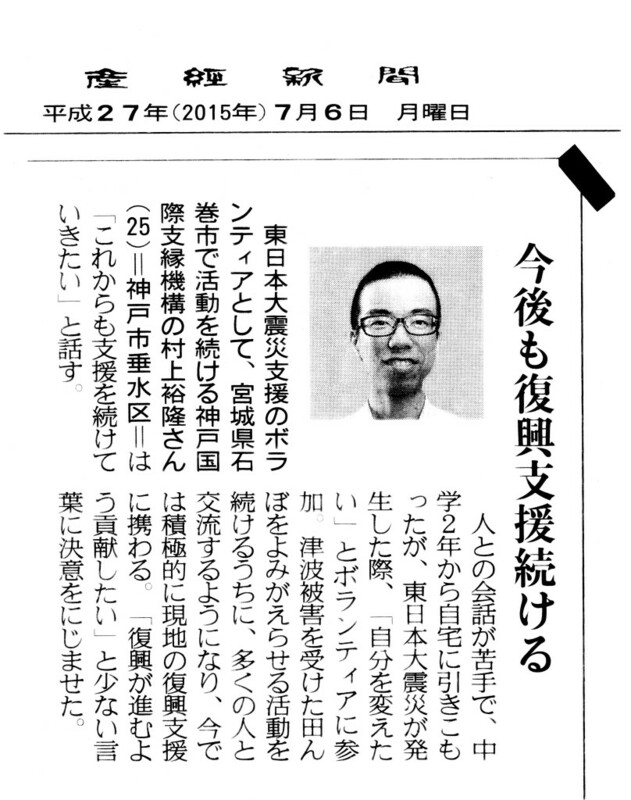 One of the fist participants Yuichi Nakata who was a student of Osaka University is currently a doctor. This experience became the starting point of his life to live for others. The key of restoration, reconstruction and rebuilding is more “recovering of mind” than the outlook. Those participants who noticed about that, they had changed not only their views of their lives, but also their carriers. The experience at the disaster area changed a pharmacist to join the Doctors Without Borders, a worker at a construction company to become a nurse, and Yamamoto to work at welfare related job after graduation from university while he continues to do volunteer works. 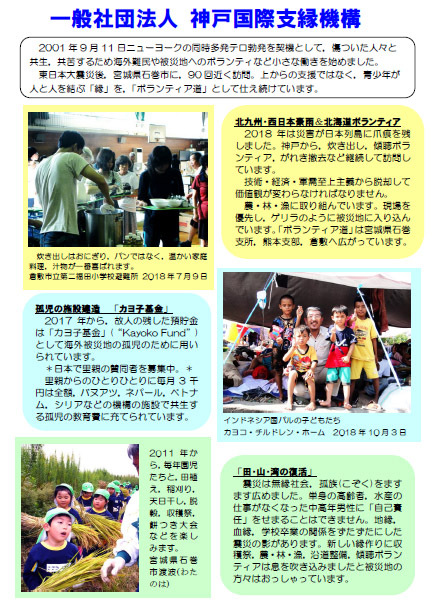 We are serving by doing volunteer at Watanoha Ishinomaki City Miyagi Prefecture, Masuki Town Kumamoto Prefecture, and Hakimasue Asakura City Fukuoka Prefecture. 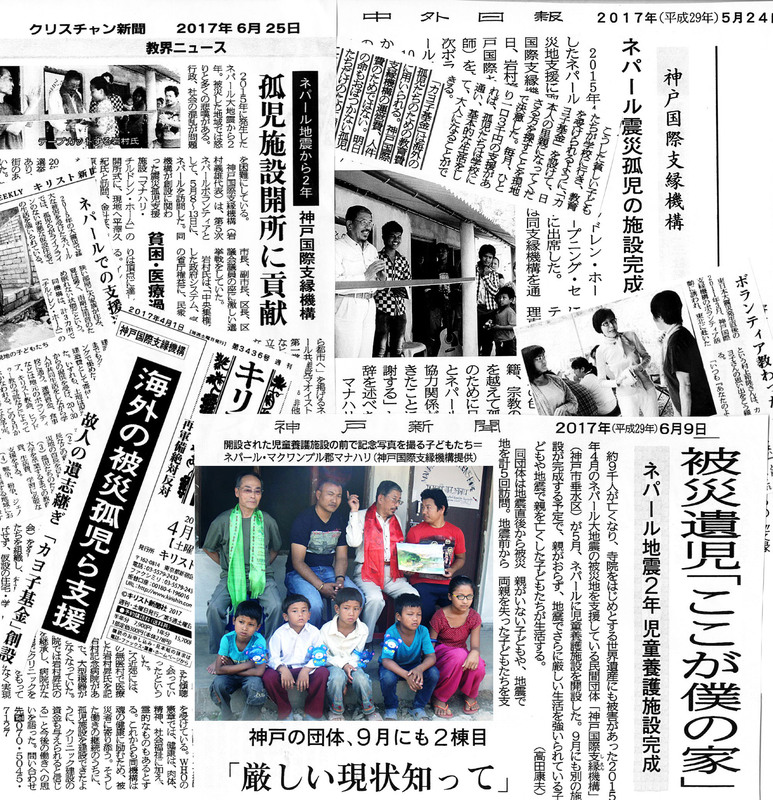 Typhoon No.18 attacked on September 10, 2015, so four male members of the Kobe International Christ Church went to do volunteer work at Kinugawa Flood Damage from September 20 to 24, 2015. At the 2016 Kumamoto and Ōita earthquakes, which was the great earthquakes occurred on April 14 and 16 (the main shock), 2016, our three church members went out to the affected site on April 17 (Sunday) after the worship. 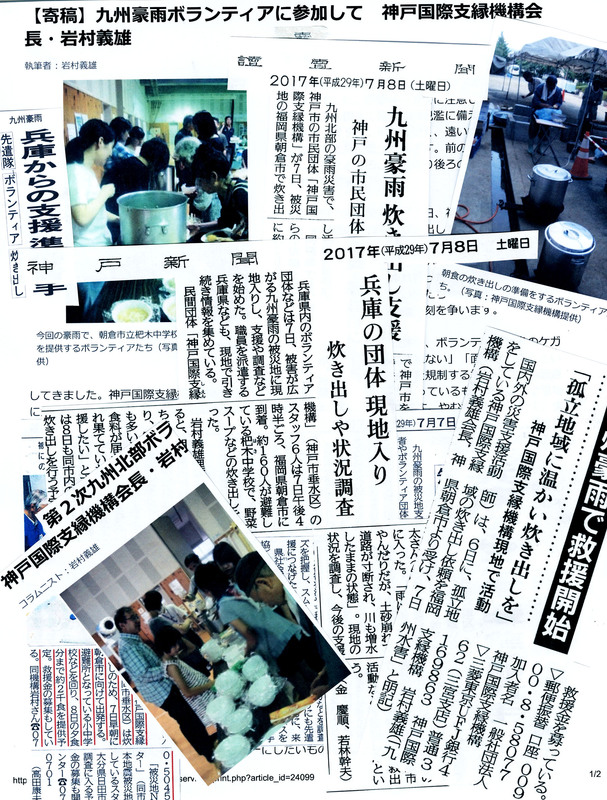 As soon as we heard about the Northern Kyushu Heavy Rain on July 5, 2017, five Christians served to provide 200 meals from night of July 7 (Friday) for 11 times. To support this activity, three people headed from our church. 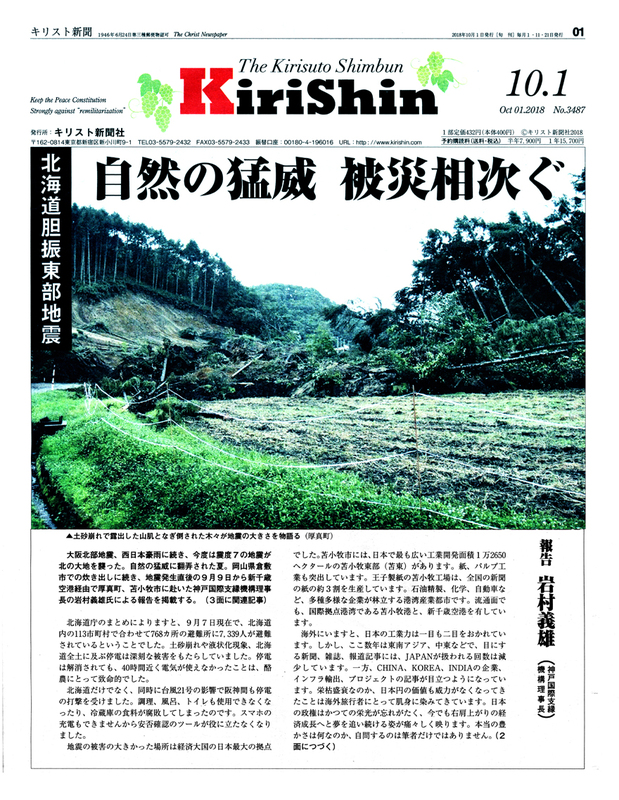 『中外日報』(2016年４月20日号)　Northern Kyushu Newspapers, July 2017. 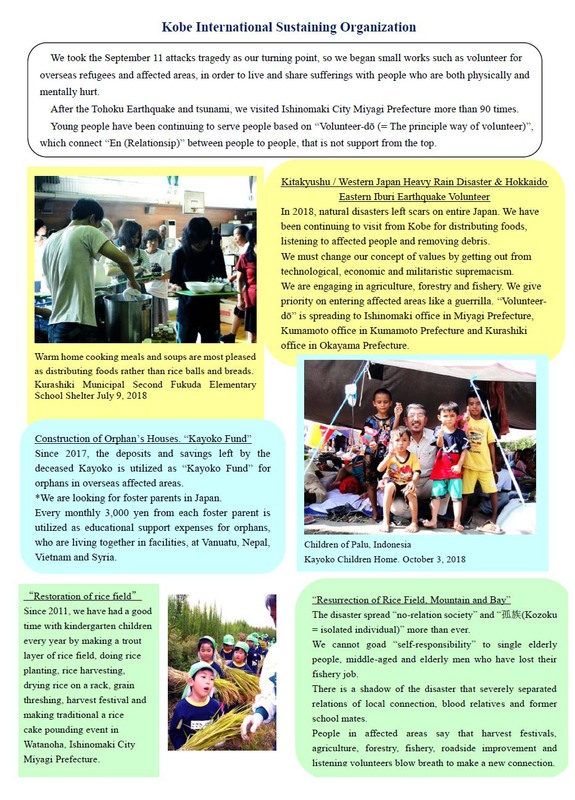 Continuation of the Tohoku Volunteer is supported by prayers of the Tarumi Prayer Meeting Prayer, neighbors of the pastor’s house and every volunteer participant. <<Reference>> “Volunteer-dō” is not intended for missionary work of Christianity. <<Reference>>　We do action to share the gospel without doing evangelism in the disaster affected area, which means that taking care of the victims. 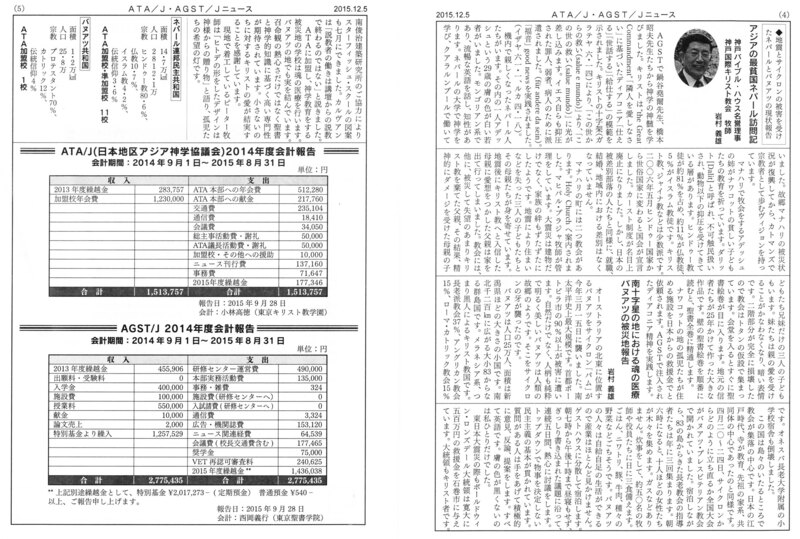 ⇒ Schedulu of the Kobe International Sustaining Organization <<Reference>> We will be the presence to provide good work with doing such as providing good not only in Japan but also anywhere in the world where are suffering from disaster affection. <<Reference>>Tohoku, Tanba Flood Damage, Vanuatu, Nepal, Vietnam, Syria, Indonesia Palu. (Timothy 2:21). 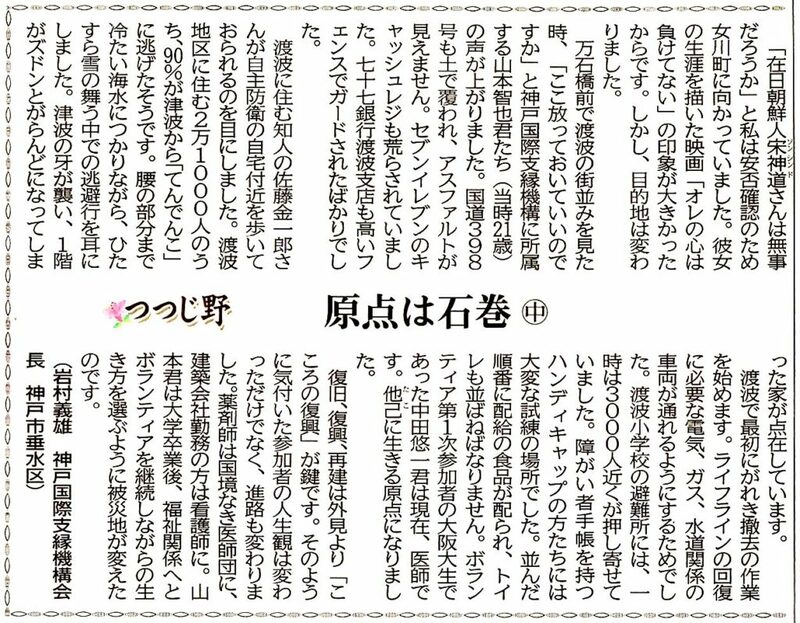 “Chugai Nippoh” (April 23, 2014) Yoshio Iwamura. 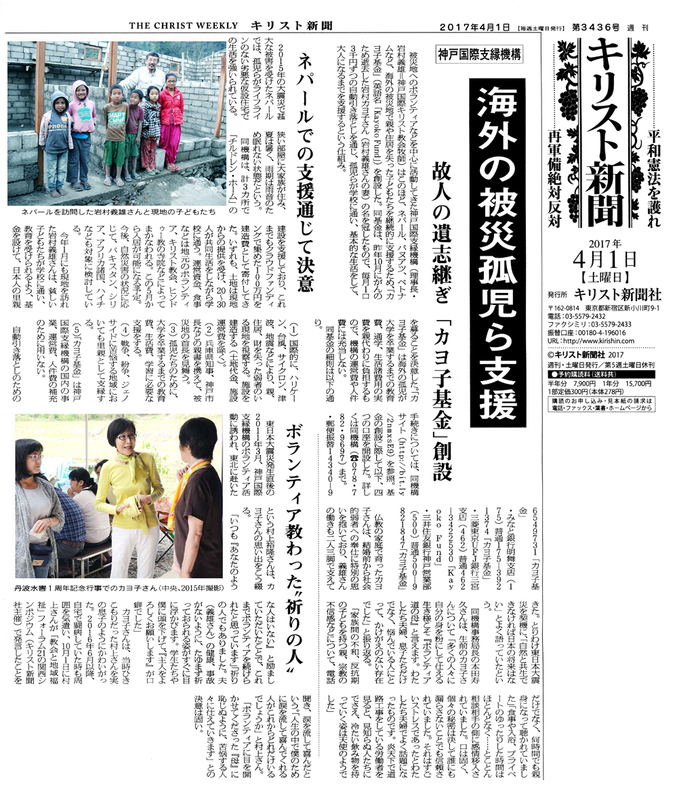 ①Visit to the poorest countries in Asia, Nepal.